Computers are often regarded as tools of self-enhancement. Using them to increase our creative potential is not only a possibility but an evermore obvious asset. The question is how to do it and which aspects should we consider? This article is based on the paper Generation of Concept-Representative Symbols. Nowadays we use computers – in their many forms – not only for work but also as self-improvement tools, be it as a way to always be connected to other people, to assess our body status by constantly measuring it, or to even micromanage our home appliances. Nonetheless, it seems obvious that we are underestimating something that could be highly improved: our mind. More specifically, using computers to foster our creativity. There is already a number of apps that allow us to turn our vacation pictures into self-named pieces of art; but isn’t there a more useful way of using our computers for creative purposes? On one hand, creativity support tools help users in activities ranging from drawing or sketching [1,2] to typeface design . These tools, however, are limited in terms of creative contributions to the process. On the other hand, some researchers are already focused on trying to make computers be creative on their own – for example, some artificial artists are AARON , The Painting Fool  or DARCI . These generative systems normally do not consider the feedback from the user. Nonetheless, we believe that for creative stimulation the sweet spot is somewhere between these two ends. Inspired by the way humans naturally collaborate in creative domains, as such as musical improvisation, we believe we should have a similar approach towards computers. When considering computers as an extension of our body, co-creativity seems the way to go. In co-creativity, participants are normally considered equal, building on previous contributions and mutually influencing each other. Each brings its own knowledge and experience to the process, leading to different interpretations and unexpected solutions [7,8]. visual arts: a drawing system capable of contributing in a creative way by suggesting new elements . Computers have the potential to not only turn our bad ideas into good ones, but also to possibly lead us to a “Eureka!” screaming frenzy. As far as brainstorming for a concrete idea is concerned, a visual approach seems to be the most logical one – after all, sketching is often used in the ideation process . However, in order to generate ideas, we first need to represent them. Humans have been visually representing ideas since more than two hundred thousand years ago. Take for example cave paintings. These representations vary from being completely pictorial, e.g. pictograms, to more abstract, e.g. ideographs. Fig. 1 Spectrum of abstraction. The more simple it is, the more people it can represent. Adapted from . This shifting along the spectrum of abstraction (see Fig. 1) may bring interpretation issues when aiming for clarity but does not pose a threat when dealing with unlocking creativity and fostering ideas. Representing concepts and their connections does not have to be done in an obvious way – it can be done by only giving visual clues. In this sense, semiotics and hidden meaning seem to be great options. There are three main sources of semiotic properties that can change the meaning of a representation: shape, color and position. Firstly, shape and color seem to have the most immediate impact. Wheeler  even points out that in terms of sequence of visual perception and cognition, the brain firstly acknowledges shapes and only after considers color. There are unlimited ways of visually representing a concept. However, when just considering the shape itself, its visual qualities may cause us to automatically perceive it in a certain way, even unrelated to the concept being represented. Consider these two simple shapes: one smooth and curved; another rough and jagged (see Fig. 2). Fig. 2 Nonsense shapes firstly presented by Wolfgang Köhler . Shape A is described as smooth and curved; shape B as rough and jagged. This mapping between sound and visual shapes was later known as the bouba/kiki effect. According to studies done by Bernard Lyman , there are concepts consistently attributed to these meaningless shapes. Some concepts were even agreed upon by 100% of participants, such as “calm” for shape A and “angry” and “resentful” for shape B. A tendency can also be observed in some abstract non-emotional concepts – e.g. 87% attribute shape A to “eternity”; 80% attribute shape B to “consciousness” . This attribution bias goes one step further when considering names without any apparent meaning. According to psychologist Wolfgang Köhler , most people attribute “maluma” to shape A and “takete” to shape B, without any hesitation. Humans tend to perform mappings among domains, namely between image and sound. Sharp shapes tend to be associated with harsh-sounding names and organic shapes with smooth ones , which can explain these name-shape attributions. Choosing a color is no ordinary task as it is directly connected to the meaning of the representation. By simply attributing a different color to the same symbol, its perceptual meaning also changes. Consider how the meaning of a banana can change with its color:One example of this can be seen in Fig. 3 which shows how the meaning of a banana can change with its color. A red banana, despite existing, will probably seem weird to anyone not familiar with them. Nevertheless, this aspect has more to it than simply picking a color based on a single meaning. The same color changes in interpretation according to what is being represented. Fig. 3 Two examples that show how color can affect meaning. On the left is the banana example and on the right the traffic light example. In both examples, changing color changes the meaning. When comparing both, one realises that the same color can have different meaning. Imagine you’re at a traffic intersection. If you always understood banana-green as a sign to “patiently wait,” then driving will most likely result in a loud honking symphony (see Fig. 3). In the same way, upon facing a red traffic light, there is often not much time to contemplate its meaning (as you might have with a red banana), because that confusion and hesitation could cause a life-threatening situation. Like the ones before, the semiotic factor of position can entirely change the meaning of a representation. This is observed in Fig. 4, in which the same elements are positioned differently, leading to three different interpretations. Using position in symbol combination to obtain different meanings has been applied by several authors, one of which is Charles Bliss . Fig.4 Difference in meaning according to position. The left pictogram means "give," the middle means "receive" and the one on the right means "take." Adapted from . Since we form ideas when we are being stimulated by either visual, auditory or tactile stimulus, we believe that the future of creativity is somehow connected to computational sensorial stimulation. By focusing on the visual domain, the biggest problem lies in aligning the user interpretation with the computer's. Finding a way for computers to share our semiotic knowledge will improve their ability to successfully cooperate with us in a creative task. However, this is related to a complex problem in computation which deals with how computers use common sense information. Such a problem should be seen as a priority if we are to fully shift away from using computers as tools and see them as partners as well as make computational co-creativity applications available to the general public. Cunha, J. M., Martins, P., Cardoso, A., & Machado, P. (2015). Generation of concept-representative symbols. In ICCBR (Workshops), 156–160. a special thanks to Filipe Carneiro for helping with the featured image. See some of his concept art and design related works. Dixon, D., Prasad, M., & Hammond, T. (2010, April). iCanDraw: using sketch recognition and corrective feedback to assist a user in drawing human faces. In Proceedings of the SIGCHI Conference on Human Factors in Computing Systems (pp. 897-906). ACM. Lee, Y. J., Zitnick, C. L., & Cohen, M. F. (2011, August). 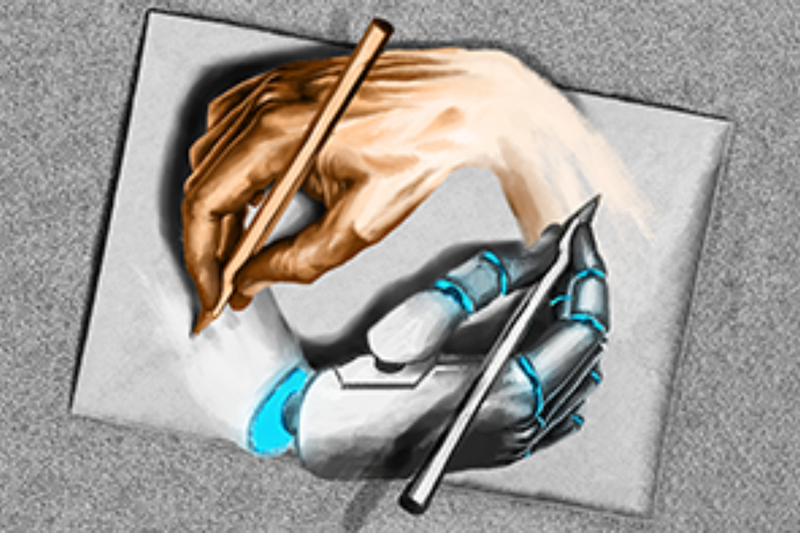 Shadowdraw: real-time user guidance for freehand drawing. In ACM Transactions on Graphics (TOG) (Vol. 30, No. 4, p. 27). ACM. Cunha, J. M., Martins, T., Martins, P., Bicker, J., & Machado, P. (2016). TypeAdviser: a type design aiding-tool. In C3GI@ ESSLLI. McCorduck, P. (1991). Aaron's code: meta-art, artificial intelligence, and the work of Harold Cohen. Macmillan. Colton, S. (2011). The painting fool in new dimensions. In Proceedings of the 2nd International Conference on Computational Creativity (Vol. 112). Mamykina, L., Candy, L., & Edmonds, E. (2002). Collaborative creativity. Communications of the ACM, 45(10). Jordanous, A. (2017). Co-creativity and perceptions of computational agents in co-creativity. In Proceedings of the Eighth International Conference on Computa- tional Creativity, Atlanta, US. ACC. Hoffman, G., & Weinberg, G. (2010, April). Shimon: an interactive improvisational robotic marimba player. In CHI'10 Extended Abstracts on Human Factors in Computing Systems (pp. 3097-3102). ACM. Long, D., Jacob, M., Davis, N., & Magerko, B. (2017, June). Designing for Socially Interactive Systems. In Proceedings of the 2017 ACM SIGCHI Conference on Creativity and Cognition (pp. 39-50). ACM. Davis, N., Hsiao, C. P., Singh, K. Y., & Magerko, B. (2016, September). Co-creative drawing agent with object recognition. In Twelfth Artificial Intelligence and Interactive Digital Entertainment Conference. Knapp. J. (2016, February 24). Google Ventures On How Sketching Can Unlock Big Ideas. McCloud, S. (1993). Understanding comics: The invisible art. Northhampton, MA: Kitchen Sink Press. Wheeler, A. (2009). Designing brand identity. Jakarta: John Wiley and Sons Inc.
 Lyman, B. (1979). Representation of complex emotional and abstract meanings by simple forms. Perceptual and Motor Skills, 49(3), 839-842. Köhler, W. (1970). Gestalt psychology: An introduction to new concepts in modern psychology. WW Norton & Company. Ramachandran, V. S., & Hubbard, E. M. (2003). Hearing colors, tasting shapes. SCIENTIFIC AMERICAN-AMERICAN EDITION-, 288(5), 52-59. Bliss, C. K. (1965). Semantography (Blissymbolics): A Logical Writing for an illogical World. Semantography Blissymbolics Publ. Krampen, M., Götte, M., & Kneidl, M. (2007). Die Welt der Zeichen: Kommunikation mit Piktogramme n/ The World of Signs: Communication by Pictogram. avedition GmbH, Ludwigsburg. 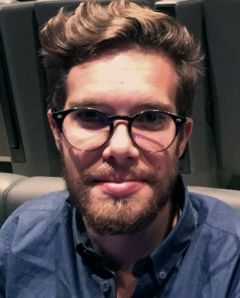 João Miguel Cunha is a cross-media Designer and a lecturer on the Undergraduate and Master degree courses in Design and Multimedia at the University of Coimbra. He is currently a Ph.D. Candidate working at the Computational Design and Visualization Lab of CISUC, Centre for Informatics and Systems of the University of Coimbra. He holds a Masters and a Bachelor's degree in Design and Multimedia from the University of Coimbra. He is mainly interested in the fields of Computational Creativity and Computer aided systems.